I was a participant in the Louisiana Universities Marine Consortium (LUMCON) OCEANDOTCOM program in 2018. At that event, the gathering of scientists, communicators, educators, and more, were challenged to come up with ways to tell the stories of coastal optimism along the Louisiana coast. The weekend was filled with conversations with local residents and trips in the field. I think the most surprising conversations I had (“surprising” in that it wasn’t expected) was on my flight back home to Philadelphia. I was sitting next to a woman on the plane, a Louisiana resident, and she asked why I was traveling. I explained the workshop and coastal optimism theme, and she immediately said, “oh yeah, the Christmas trees – the Christmas trees are a good thing.” I was so curious about the connection between Christmas trees and the coast, since we hadn’t talked about that at LUMCON and I didn’t even mention Christmas trees to her, that I did some research. What I learned then inspired me to design from scratch a quilt to tell a story of coastal optimism in Louisiana with Christmas trees. Louisiana is reported to be losing 25 to 35 square miles of coastal wetlands each year – one football field of land per hour. The causes of the land loss are from natural causes and human interference, and include reduced sediment flow from the Mississippi River and its tributaries, land subsidence, and sea-level rise. To combat the diminishing and degrading coastal habitats, Jefferson Parish instituted a program that found a role for discarded Christmas trees to lessen wave energy and to combat erosion. Wooden cribs are constructed parallel to the shoreline to hold the trees. Volunteers, the Louisiana Air National Guard, the U.S. Fish and Wildlife Service, and others have coordinated the collection and placement of trees in these pens to lessen the impact of waves and storms. The calm water between the cribs and coast traps sediment and allows for plants and aquatic life to establish. Jefferson Parish has been tracking the impact of this Christmas tree recycling project. Between 1998 and 2015, an unprotected area of shoreline lost over 23 acres of habitat, while a section protected by trees only lost 3 acres. The Christmas tree recycling program not only assists coastal habitats but generates awareness among Louisiana residents and provides an opportunity for participation in making a difference for the coast. Here’s a video from the Louisiana Air National Guard, showing how the trees are placed. And now… here are photos of my completed quilt! The quilt is to be viewed from the top to the bottom, representing a relative sequence over time as viewed at one location. No quantitative data is implied in terms of spatial or temporal patterns sewn. Each horizontal gray strip of fabric represents breaks in time. 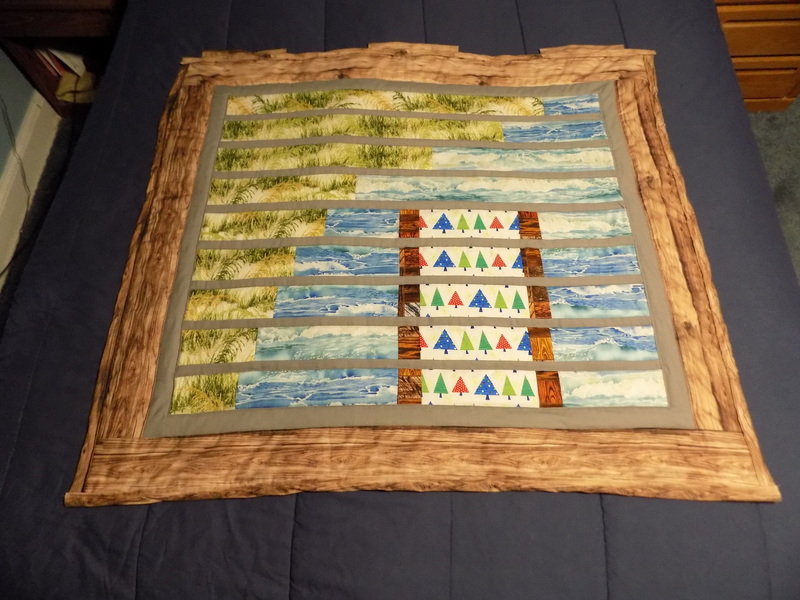 At the top of the quilt, one sees a wide strip of “plant” fabric representing a marsh coastline, and a smaller piece of “water” fabric representing the coastal water. As one moves down to the next row of plant/water fabric, there is less of the land fabric and more of the water fabric. This is to represent erosion occurring along the Louisiana coast, where marsh habitat is being lost from wave energy, subsidence, seal-level rise, etc. As one moves down the next several rows, there is a continued loss of the coast with an increasing encroachment of water. In the middle of the quilt, a Christmas tree crib appears. The successive rows show a reduction in loss of the marsh over time, reflecting the results shared by Jefferson Parish (still marsh loss but less volume when the Christmas trees were put in place). This is my story of coastal optimism – a story of habitat loss and degradation that is slowed by the placement of discarded Christmas trees. The quilt measures 42 inches wide by 38 inches in height with fabric from Zook’s Fabric Store (Lancaster), The Old Country Store (Lancaster), and JOANN Fabric & Craft (Springfield). So thank you to the woman sitting in seat 17B on American Airlines flight number 1630 on March 20, 2018 – I appreciate your inspiration and your optimism!